With Donald Trump now vying with Jeb Bush for the top spot in the national polls for the Republican presidential nomination, one would think the media would begin more deeply investigating his stance on the issues, or documenting his governing philosophy. Instead, this morning’s Sunday talk shows all featured discussion of The Bombastic One’s latest off-the-cuff personal attack, this one targeting Arizona Senator John McCain for his recent description of Trump supporters as “crazies”. The Donald, of course, is not one to miss an opportunity to engage in personal warfare against any critic (Rosie O’Donnell anyone?) – indeed, he relishes these public feuds in no small part because he knows they provoke the media coverage that is partly responsible for fueling his meteoric rise to the top of the national polls. The Donald’s comments about McCain – as he intended – sucked up almost all the weekend media coverage, and left second-tier Republican candidates like Rick Perry trying to bolster their own anemic polling by expressing outrage over Trump’s criticism of a decorated war veteran. That, of course, meant that they spent part of their brief media time talking about The Donald, rather than their own candidacies – which is precisely what The Bombastic one wants. Trump’s media coverage to date reflects a basic weakness of how journalists cover elections more generally – one I’ve talked about in previous posts: it tends to describe election contests in terms of candidate personalities and campaign tactics rather than focusing on candidates’ issue stances and expertise. In Trump’s case, we see these media tendencies illustrated in spades. But by characterizing Trump as a bombastic buffoon who shouldn’t be taken seriously (the left-leaning Huffington Post recently announced it would move its Trump coverage to the entertainment pages) journalists are playing directly into Trump’s hands. In fact, his polling support is coming from that part of the electorate that is increasingly dissatisfied with what it views as a corrupt political establishment, one that is not addressing bread-and-butter issues like job creation, trade policy, immigration reform and border security. And the media, like it or not, is often viewed by these voters as part of that establishment. As a classic example of how not to cover The Donald, look at Martha Raddatz’ interview with him today on George Stephanopoulos’ This Week morning show regarding his war hero comments. She repeatedly tries to publicly shame The Donald for his remarks and to insinuate that he is emotionally unfit to be president, but Trump adroitly uses the opportunity to double down on his earlier remarks and, not incidentally, to reach out to veterans. When the interview concludes Raddatz can barely prevent herself from rolling her eyes at The Donald’s remarks. However, I would not be surprised if Raddatz’ questions and demeanor actually bolstered Trump’s standing with a segment of Republican voters. The problem with the media coverage, at root, is that its persistence in portraying The Donald as a cartoon figure is at odds with his undeniable accomplishments. While the media chases its tail in trying to hold the Donald accountable for his latest outrageous statement, he uses that coverage to cite his very real track record of getting things done, and to promise that he will reprise that record as President. But it is in fact Donald’s private sector experience (and concomitant lack of political experience) that is potentially the real vulnerability of his candidacy, if only the media would take the time to examine it. Consider the following anecdote provided by the late, great political scientist James Q. Wilson in his classic book Bureaucracy, which is a study of how government works – or does not work, as the case might be. In the early 1980’s, as Wilson tells the story, the city of New York spent some $13 million dollars across a six-year period in an ultimately fruitless effort to renovate the Central Park skating rink. At this point The Donald stepped in and agreed to renovate the rink for $3 million, with any cost-overrun coming out of his own pocket. Mayor Ed Koch agreed to the deal. Trump completed the rink renovations a month ahead of schedule, and $750,000 under budget. At first glance, this example seems to feed into The Donald’s argument that as president he would have the expertise and experience to get things accomplished. Indeed, that is precisely the mantra The Donald repeats at every campaign stop – his standard stump speech includes multiple statements that begin: “As President, I will” accomplish some objective, whether it means building a wall to keep out illegal immigrants, or negotiating a more favorable trade deal with the Chinese government, or any number of accomplishments. But in reciting this story about the skating rink, Wilson is making a more subtle and important point, one that potentially undercuts the relevance of The Donald’s private sector experience as preparation to be President. Wilson is using the skating rink example to demonstrate how the very factors that made the Donald so effective in the private sector are rarely to be found in the political sphere. As Wilson acknowledges, The Donald proved far more efficient than did government in renovating the skating rink. But ultimately public policy is evaluated on more than narrow grounds of economic efficiency – instead, “government has many valued outputs, including a reputation for integrity, the confidence of the people, and the support of important interest groups.” When it comes to skating rinks (or any government program), Wilson argues, “A government that is slow to build rinks but is honest and accountable in its actions and properly responsive to worthy constituents may be a very efficient government, if we measure efficiency in the large by taking into account all its valued outputs.” I would add that governing in the public sphere at the national level requires an understanding of how to address the interests of those, such as members of Congress, whose support is required if the President is to accomplish his objectives. By extension, Wilson is suggesting that the tactics that work so well for The Donald in the private sector are unlikely to be as effective when it comes to passing public policy. This is because other values – accountability, transparency, and equity – are embedded in our political process to a degree not seen in private sector transactions. As President, The Donald will find that he cannot run roughshod over the political constraints built into our national system of separated institutions sharing power. Building a wall to keep out illegal immigrants will be nothing like renovating the Central Park skating rink, and that is not simply due to the different scale of the projects. It is because the incentives facing political actors, including the President, do not reward them for maximizing efficiency alone, at least in the narrow economic sense. Instead, to achieve one’s goals in the political sphere means utilizing tactics that emphasize “we”, not “I”. Based on his public statements to date, it is not clear how well The Donald understands this. So how should the media cover The Donald? Not by ignoring him, or dismissing him as a “farce to be reckoned with”. Instead, journalists should take his candidacy seriously by pressing him on the details of his policy pronouncements, and helping the public understand the differences between the public and private sector. The sooner the media begins evaluating The Donald on the details of his policies and his governing expertise, rather than on his deliberately provocative comments designed to mobilize a disaffected public, the sooner The Donald’s political bubble is likely to burst. Alas, I have little confidence that most journalists, in this era of dwindling audiences and shrinking profit margins, will be able to resist taking the easy road by dismissing The Donald as a serious candidate. 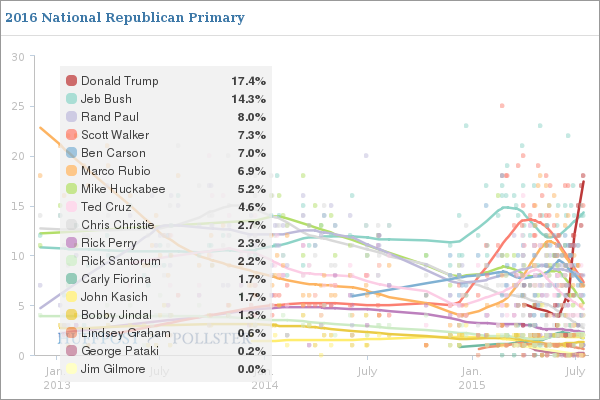 To date, it is a media strategy that has The Donald laughing all the way to the top of polls. Trump is a buffoon. You are not; you make an excellent argument that the media should seriously cover his policy stances and expertise. Why, then, do you refer to him as “The Donald,” a sobriquet used by his Czech first wife? That isn’t a serious approach either to Trump or the media coverage of him. Frankly, it’s buffoonish, and by doing it, you undercut your own argument. Longtime readers will know that I frequently inject some off-beat humor (or what I like to think is humor!) into my posts. These are meant to add a bit of entertainment value to what are otherwise meant to be data-driven, dispassionate analyses based as much as possible on what political scientists think they know about politics (which often isn’t much!). I realize my quirky asides aren’t for everyone but I hope some readers appreciate them, at least a little bit. Also, since I’m not a journalist (anymore) covering The…er…..Trump, I don’t necessarily think my argument applies to me. But I appreciate your input – if the use of the aforementioned sobriquet detracts from the point of the post, then it is getting in the way of the analysis. I certainly don’t want that! Let me consult with some other readers about this. I think that your reference to Donald Trump as “The Donald” actually adds to your post because it acknowledges his incredibly public persona that he has been crafting for decades (it’s also very funny). I am very much in agreement with the argument you put forth in your post. The liberal media is quick to dismiss the Donald, while simultaneously covering him obsessively. HuffPost’s refusal to cover the Donald in their politics section, is honestly baffling to me–Not because I agree with his politics, but for a supposedly serious and incredibly popular news source to ignore a supposed “front runner,” while happily reporting on the other passengers in the clown car that characterizes the Republican field, is not only self righteous, but it’s irresponsible reporting. We all must accept that the Donald is being taken seriously by some of the people in this country. It’s the job of journalists to try and explain why this is happening, why do some people want Mr. Celebrity Apprentice to have access to our nuclear launch codes? It’s the job of journalists to SHOW us, using more than just a few comments, why we might or might not want Donald Trump, a volatile, self obsessed, yet impressive business mogul with no political experience to run our country. The media needs to stop simply adding to the unmatchable level of name recognition that Trump already possesses and actually do their job. My one question/comment regarding this post is though the media should be taking Donald’s candidacy seriously, do you think that they shouldn’t be engaging in the outlandish and offense commentary that he is making at all? And if they do, how can the buffoonish [or maybe it’s my own evident biases that cause me to definitely characterize his commentary as such] nature of his commentary be completely ignored? I think there is a way to look at Trump’s comments about McCain, for example, and to examine how not only are they offensive, but the fact that he made them shows that he has no understanding of how things get done in Washington and how comments like that will vastly undermine him as Commander and Chief. Is it biased or partisan to think that calling the majority of Mexican’s rapists and criminals racist and bad political move if you’re also spending time showing how that comment highlights his policy stances? Is it partisan to say that that’s maybe not the best language for someone who wants to lead a country full of immigrants to be using as long as they explain why that’s the case? Most people think politics are boring. If Taylor Swift were running for President at this point in this election she would also probably poll well. I think journalists should use the buzz around the Donald’s comments to remind us that this isn’t Prime Time, this is the future of our country we are talking about and by taking the Donald out of the politics section the Huffington Post seems to be doing just the opposite. Your injection of the humorous phrase “…thank you, may I have another?” may be lost on the generation of young men who have not had the distinct pleasure of being whacked hard with a fraternity paddle. I know fraternities are officially banned from Midd, but is there really a good reason for the ban? Distinct pleasure? I get myself into enough trouble without debating the merits of fraternities and hazing! Let’s stick to presidential politics for now, shall we? Joy Reed got it right when she said, “Trump fans don’t care AT ALL what he does to the country — only that their guy is in, and he’s creating hell for all the people they hate”. Trump and his constitutes consider Facts & Truth is nothing more than “Fake News” Enjoy my blog, “TRUMP MEDIA WAR”.